You have been putting up with overhead space constraints and overhead beams in your garage for too long. So long, in fact, that you probably don't even realise how cumbersome and unappealing they are? We're talking about the overhead beams from sectional garage doors and there is an alternative. 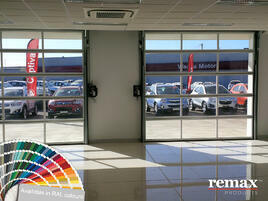 There is a very simple solution available and it comes in the form of the Compact Sectional Door by Remax. The door leaves of the Compact Sectional Door fold up, concertina style, into a tidy and small 730mm wide unit overhead. This small unit can also be recessed into ceiling itself creating the look of just a wall of glass / door leaves, leaving your ceiling area free of overhead beams / overhead tracks or support bracing. We discuss four reasons you should say goodbye to overhead contraints from your overhead sectional doors. 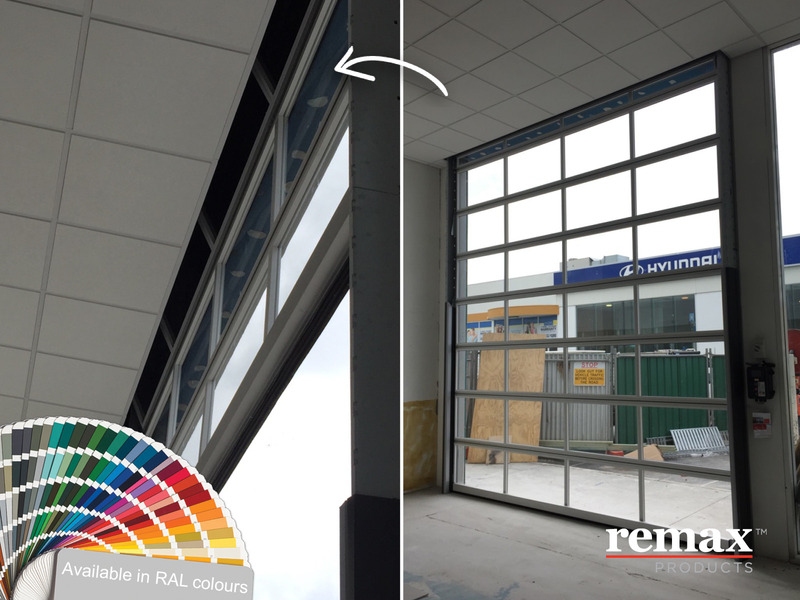 The Door Leaves can easily be hidden above the ceiling to create a unique, clean, wall of retractable glass (or thermal RAL block panels to match the colour of the building). See below sectional door in during both opening state (left)and whilst closed (right). With all the important 'stuff' being kept in garages nowadays, if your garage door does end up getting jammed / stuck - you would certainly need to arrange an urgent call-out or carry out some urgent repairs in order to securely close your garage before leaving home. Not ideal! The traditional sectional door moves on rails into the building across the ceiling or directly above the access. To do this they use balance springs, which are highly-tensioned steel springs that need regular maintenance to maintain their tension. These springs also need regular replacement, which takes up a lot of time and is expensive. Avoid getting into a situation where the door is jammed / stuck and a call-out is necessary; know your door and the moving parts. There are two main styles of one-piece springs. The first is the standard spring. This spring is used by a variety of door manufacturers. 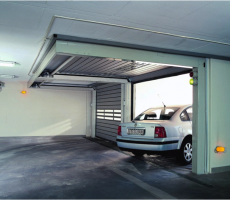 If the top of your door has rollers that move along a metal track that extends horizontally toward the back of your garage, you have standard one-piece springs. Furthermore the door continuing to work smoothly and reliably is an issue, with the complex arrangement of rails that the door moves on requiring careful maintenance of the track rollers and hinges. At the same time the steel rail structure needs to be regularly checked for safety. One system that has been much used is the steel roller shutter, which needs minimal maintenance but also has many disadvantages including poor insulation. Today, the roller shutter is being used less and is frequently being replaced with an insulated sectional door with more options. The Compact folding door is often used as a replacement for these sectional doors. This folding door is self-supporting with its side rails, so nothing more is needed. 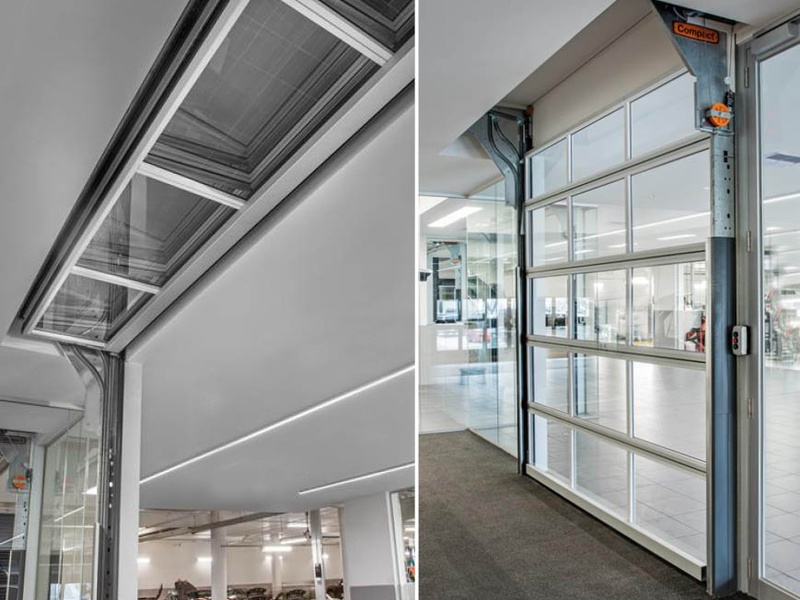 The Compact door folds up above the door opening and therefore does not require a steel structure on the ceiling or above the access. No balance springs are needed, the door blade is moved up by an electric motor and when closing gravity plays its part. The advantage of this is that there are lower maintenance costs because there is simply less to maintain. The quiet and gradual movement uses little energy and this means a longer lifespan and lower maintenance costs. If you enjoy using your garage space for more than one purpose, such as games area / man-shed / home bar / entertainment area / kids play area / teenage retreat (or should it be a parent retreat from teenagers?? :) - it can be an uncomfortable space to be in during the heat of summer or in the height of winter. Satnadard aluminium roller shutters / overhead doors certainly can lack insulation and a full seal against outdoor elements. The Compact Sectional Door is designed with insulated sandwich panels 40mm thick, with U-value for the panels of 0.76W/m². The total U-value number of the complete door will be affected by the building and the environment.For example when the floor is not 100% levelled you could have a very small gap between rubber of the bottom panel and a serious loss of energy. Also we sometimes use insulation materials between the rails and the steel construction to create a “cold bridge”, which also affect the result. Next to that, the insulation value will be affected when using full vision panels, since the U-value of the Compact Sectional Door double acrylate window is ± 2.8W/m²K and single hard glass would be worse. 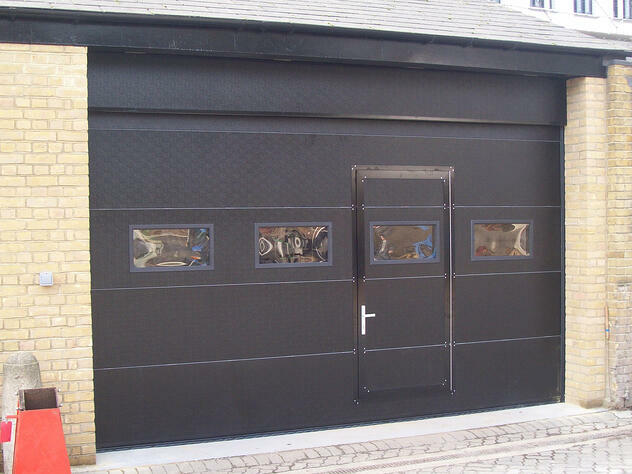 In most cases a double car garage door is 16 x 7 or 16 x 8 and single car openings are usually 9 x 7 or 9 x 8 however the Compact Sectional Door is manufactured bespoke to your requirements - and have been manufactured for a vast range of applications such as airline hangars, food processing facilities, apartment blocks, arenas and more. 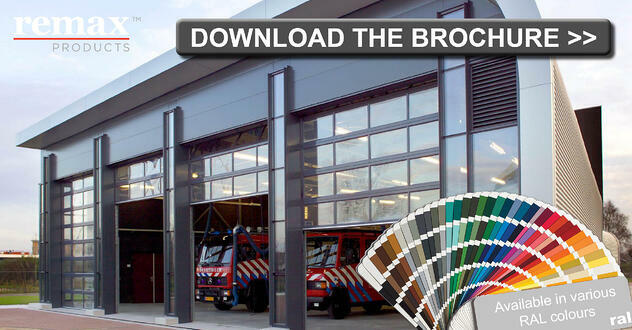 How much headroom is traditionally required to install a garage door? Headroom varies with the type of door; most doors can typically be installed with 12” to 15” of headroom plus an extra 2” for an electric opener. But the problem with traditional overhead garage doors is that it is not just the headroom which needs to be taken into account but also the overhead beams which consume ceiling space in order for the door to roll up and over into the garage space while the door is open. The Compact Sectional Door on the other hand, can be recessed into the ceiling space either totally out of view into the roof space or by allowing for a recessed area into the ceiling, the size of the stacked panels. This creates a clean flow along the ceiling allowing for other, more critical, available space for storage / lighting / sky lights. The Compact Sectional Door has also been installed in various residential applications such as home-gym, personal car showroom for care collectors or in a bespoke retail application where the door becomes a retractable 'wall' of glass. Compact Sectional Doors offer a range of design solutions to fit with the design of your home, from totally clear double glazed glass panels / or opaque panels to a thermal RAL panel - or a mixture of both coloured thermals and also windows together in one design. Contact us today to request a quote or find more about the Compact Sectional Door! 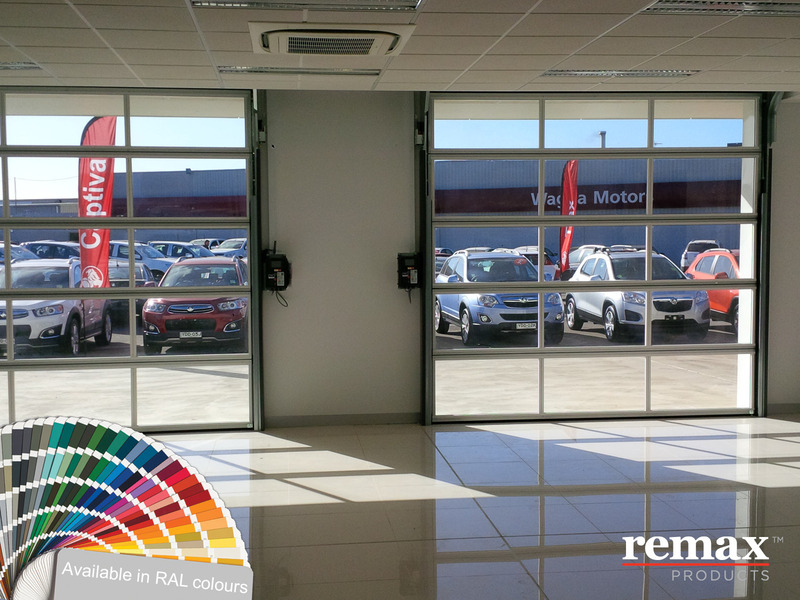 Glass Sectional Doors at Wagga Motors: Read More.